It’s over now and I’m back at work in Shreveport. Time for a review of the race. And make sure to put “White Rock Navy” in the memo field of the check. You’ll get a statement at the end of the year for your tax records and the thanks of all the Pilgrims and the Haitians they serve. So, on to the account of the race. 8:00 am in Kansas City and the gun went off. We all tried to get ourselves out into the faster waters of the Missouri and make that right turn but it was tough with that many boats. I understand that four or five boats flipped at that point, although I only saw two. Everyone managed to get back into their boats on back in the race. 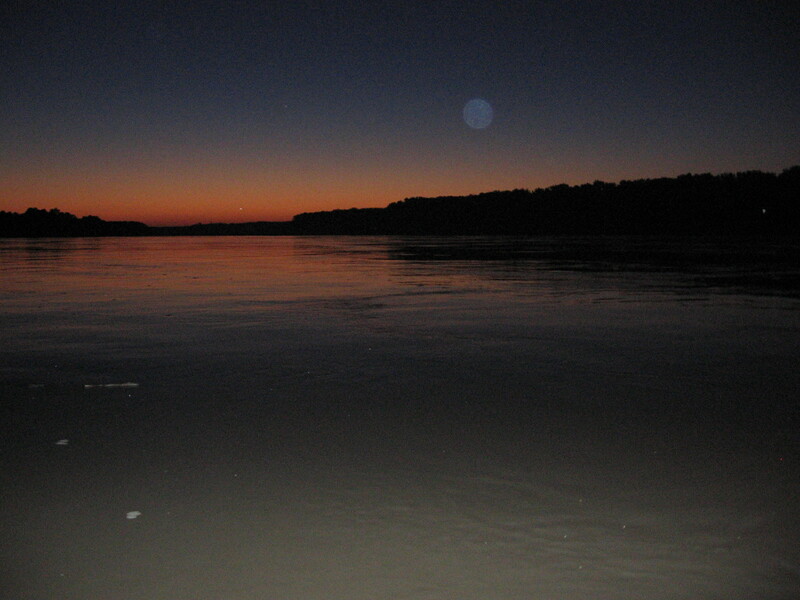 I went past my crew, stopped to pick up my sunglasses, and headed off to Fort Osage – our first planned meeting point. The first day was the roughest for me. I guess it was the excitement and, as the day wore on, the realization of what I was up against. By Lexington and Waverly I was tired and sore – and more than a little short tempered. I had watched a lot of people disappear in the distance and knew my pace wouldn’t keep me even in the middle of the pack for the days ahead. I had been navigating whirlpools and boils and was tense and sore. If you can, imagine a ten foot stretch of water moving in a clockwise direction. When the nose of the boat enters the whirlpool the whole boat is wrenched to the left. Then, as the nose reaches the other side and the back of the boat enters, the boat sweeps the right. Then when the nose is out the other side and the whirlpool is only acting on the back end, it swings to the left again! The boils are slightly different. In these the water is just coming straight up and both ends of the boat are slightly suspended. So the kayak wants to tip to the sides. And because the water is “soft” under the paddle it feels as though you’re pulling the paddle through air. Not a comfortable feeling. But I reached Waverly about an hour and a half ahead of the cut-off time. Not world class racing but I was still in this thing. I wanted to push on to Miami before getting off the river. This where the whole thing started changing for me. I know I’ve said it was an adventure and not a race but Tuesday evening that all started to become reality for me. I’d covered 73 miles and wanted to put in another 32. So, my ground crew re-equipped the boat and put the lights on and I was back on the water. As night fell I started experiencing my first hallucinations. I guess it’s the combination of stress and fatigue but as I looked over at the right side of the river it appeared to slope to the left. As I looked at the left side of the river it sloped to the right. The river was running down hill at about a 15 degree angle! Now, I knew that the Missouri river at that angle would be a raging torrent so something was surely amiss here. Then when I came to a bend in the river and saw that the right bank was lower than the left I KNEW I was seeing things. Still, the water was moving in the correct direction and, although I knew it couldn’t be real, it was comforting to think that I was paddling downhill. It took me from 8:30 pm to 1:15 am to get to Miami. I’ve never been so tired in all my life. As I came down the river in the darkness I could see the flood lights illuminating the ramp at Miami and was totally disoriented by it all. I heard people yelling at me (and the other paddlers) to “come HERE” and waving their arms. Most of us needed this instruction because our brains were shutting down. When I pulled up to the ramp I could hear people saying “Welcome to Miami” and saw others running down the ramp into the water. They grabbed my kayak while others grabbed me under the arms and helped me out of the boat. The next thing I knew they had helped me up the ramp, carried my boat away, and were pointing me to the tent where hot coffee and food could be had. All I wanted to do was change into dry clothes and crawl into a sleeping bag. My crew had called me earlier and told me they were going to grab some sleep and the plan was for me to call them as I got to Miami. Unfortunately none of us could get cell reception there so I wandered around a bit, trying to call them, before I got through. 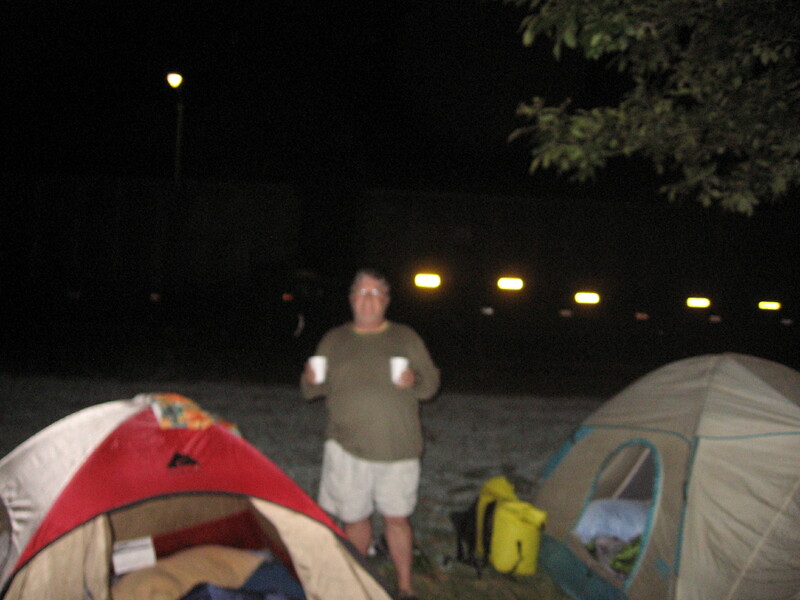 Anyway, they came running and hauled me off to the tent – set up on a gravel parking lot (the only place available). At that point sleeping on gravel didn’t sound bad to me and I actually slept better than I have in years! Day two got me on the water at 8:09. I should have gotten up sooner but I really needed the sleep. Only two checkpoints on the schedule: Glasgow and Katfish Katy’s. I hit Glasgow at a little after 1:00, tired but feeling a lot better than I had at the same time on the first day. Just below Glasgow is Lisbon Bottoms. This is a bend in the river where the Missouri has cut through and created a chute of fast water. As I was paddling down the river toward it the Glasgow Fire Department boat screamed past, then came flying upriver a few minutes later – followed by one of the race safety boats. They told me that a pair in a canoe had strayed a little too far left and been sucked into the chute and into a log jam. The pair had been pinned against the logs and hung on until they could be pulled off. Needless to say I and the other boats stayed hard right as we worked our way around that bend. But, at the bottom we had to pull hard left across to the river to avoid the biggest wing dam of the trip. Beautiful stretch of river but exhausting and pretty scary. The night before, while I was sleeping, Katrina, another paddler had been caught in a huge whirlpool while going under the Glasgow bridge. She left her boat pinned to the bridge pier and was pulled in by another racer. They were able to rescue her and get her boat off the pier and she kept on moving downstream! Talk about a will to win. Wow. After Glasgow and Lisbon Bottoms I arrived at Katfish Katy’s about 9:45. Nothing special to report about this stretch except that I went under the interstate 70 bridge – and the hallucinations started again. By this time I was getting used to them, though, so it was sort of interesting. I had forgotten to put on my kayaking shirt before nightfall and when I finally got out of the boat I was wet and cold. As soon as I stopped paddling I guess hypothermia started to set in because I could not stop shaking. It was a good thing David had his truck at the ramp and could turn on the heat because I haven’t felt that cold in a long time. I don’t know how the racers did it who went unsupported because I certainly relied on Tim, David, and Sharon to take care of me in a lot of ways. We decided to set the alarm for 5:00 and get an early start on Thursday. At the appointed hour David woke me up to tell me not to wake up – that the river was totally fogged in. I had really slept well but couldn’t do it any longer. Just too sore to stay lying down so I got up and started stretching and getting ready to go. Things finally cleared up and I was back in the boat at 7:45 and on the way to Jefferson City. 36 miles later I arrived at Jeff City to a hero’s welcome. A bunch of the family had come up to greet me and Sharon’s cousin runs a deli that was on the sand bar serving some wonderful food. I dawdled there way too long – from 1:00 until 2:15. The cutoff to get to Jeff City was 7:00 pm and the cutoff at Hermann (my next checkpoint was 10:00 am on Friday. I wasn’t in danger of winning this thing but still had plenty of time to finish. Back on the water and off to Hermann – a 46 mile run to the next checkpoint. A mile or so downriver I came across my first barge. It was a big one, loaded and headed upriver. The perfect combination to make some big five and six foot waves. I thought I’d dodged the bullet on this one because it was in the channel across the river from me. So I took a couple of pictures and watched him move past. Then I realized I was drifting toward a wing dam. My choices were to try and go over the wing dam and risk tearing a hole in the bottom of the boat or moving out behind the barge – into the waves – and seeing what a sea kayak can really do. I took the second course of action and had a great time surfing through the big waves as they bounced back and forth off the banks of the river. As evening came on the river started “tilting” again but nothing to worry about. Wednesday and Thursday had been sunny with highs in the low 80s. Beautiful weather for being on the Missouri. After the first day I had gotten used to the whirlpools and boils and felt fairly comfortable on the river. I was able to read the it and understood where the channel would be and where the current would work for me. Still, by the end of my third day, and another 82 miles, I was tired and sore as I neared Hermann. I knew I was getting close, but I wasn’t sure. 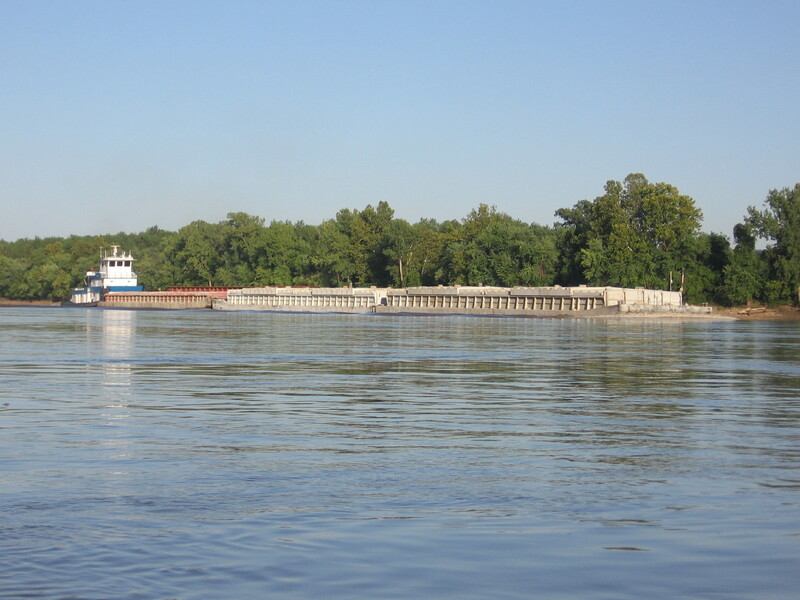 So I pulled to the side of the river to check on one of the mile markers the Corps of Engineers posts for the barge traffic. As I sat in the darkness figuring how close I was I heard the tremendously loud noise of a freight train bearing down on me. For a moment I just KNEW I was being run over by a train. But, wait a minute, I’m sitting in a boat on the river. Freight trains don’t run on the river. What the heck is going on? I was sitting at the base of a bluff, about fifteen feet below the train tracks that ran along the river. OK, panic time over and only about three miles to Hermann. Unfortunately those same trains run right along the riverfront in Hermann. And about 25 feet from where all the racers had to camp. So every hour from midnight to 4:00 am a train would come by. I’d wake up and watch the tent shake from the wind, and fall back asleep. At this point I was about 12 hours ahead of schedule. But we decided to go early on Friday so I was awake at 4:00 and on the water at 4:55. This is when things started to unravel for me and a lot of the other racers. 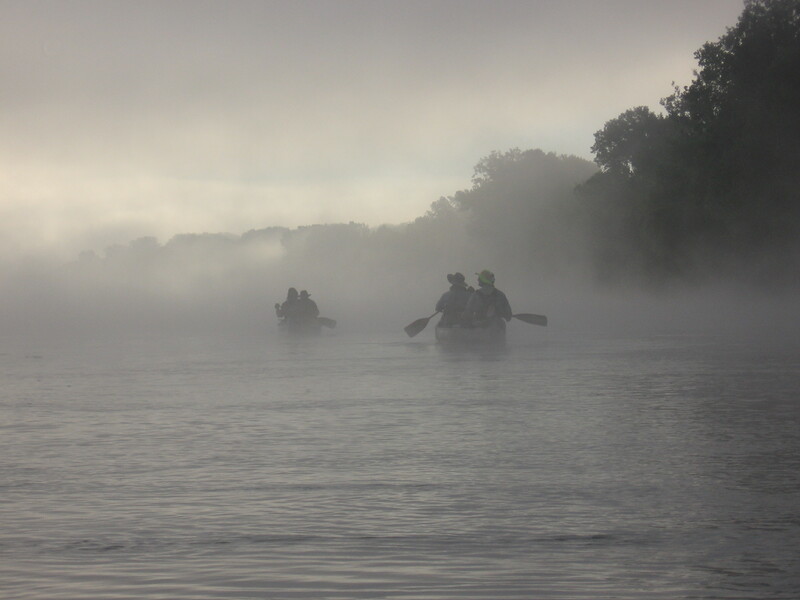 I set out with two other boats and about a mile down river the fog dropped on us like a blanket. It was dark and we couldn’t see more then ten feet. Within a few minutes I looked around and realized I’d lost them and was alone. The only thing I could think to do was to sit quietly, drift, and listen for the sounds of moving water. Occasionally I’d hear rushing water and see a buoy pop up or a wing dam coming my way – and paddle like crazy to get away. It was nerve wracking. After a couple of hours of this I saw a spot on shore where I could pull off, stretch a bit, and wait. While I was there four guys in a couple of canoes saw my lights and joined me. They said they’d been paddling and kept seeing the shore off to their left. When it appeared for the third time they realized they’d already been past that stretch of river twice! They’d been caught in a large area of rotating water and going in circles. So the five of us stood there waiting for light and the fog to lift. 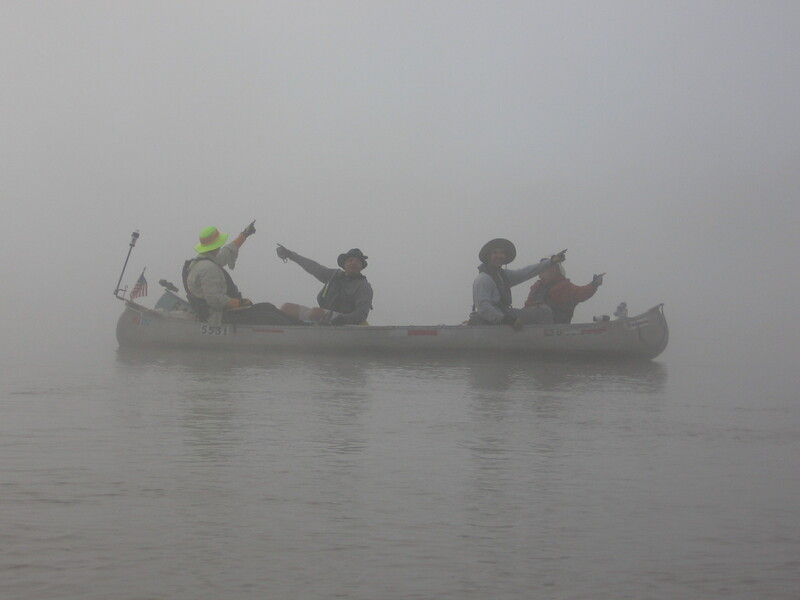 We heard voices in the fog moving upriver as confused paddlers plowed away in the wrong direction. We called to them but cold not convince them they were going the wrong way. It was that disorienting out there. Soon after the sun came up the fog seemed to lift a bit and we decided to go for it – only to have the fog drop on us again. Once again we were left drifting and listening. Trying to figure out which way to go. At one point we were paddling “downstream” and hear loud water ahead. 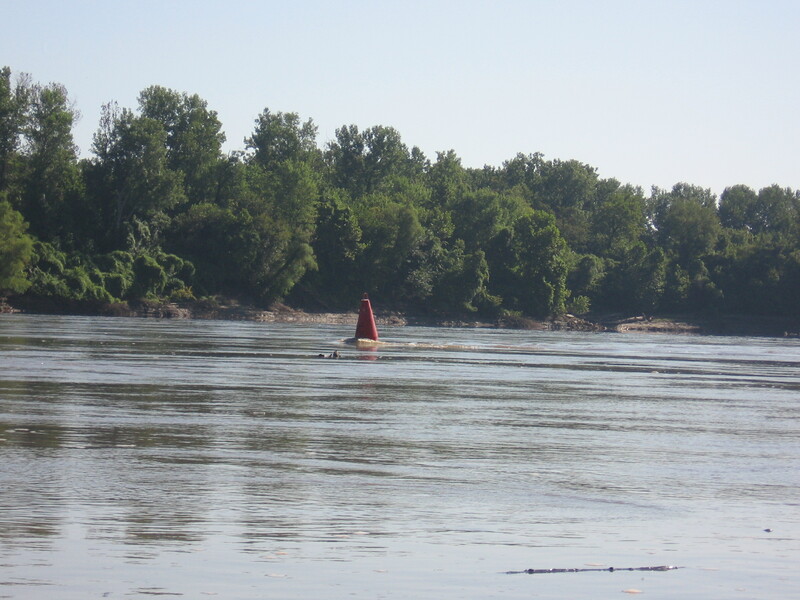 A bouy popped up about fifteen feet in front of us and we realized we had been paddling across the river instead of down it! It was a scramble to avoid hitting the thing. I didn’t get a picture of that one (a little busy at the moment) but took one later. Let's go this way, no let's go that way! The whole thing was miserable and I guess we covered about five miles in five hours. We later met a guy who had resorted to hanging on to a tree branch in the darkness because he heard loud moving water, couldn’t get out of his kayak, and didn’t want to risk going through whatever was there. He finally had enough light to navigate the area but said he’d almost given up and called a rescue boat on his cell. So much for an early start and a quick arrival at the finish line. But the rest of the day was great. One more barge (this time lightly loaded with not such bad waves) and I covered the 42 miles to Klondike checkpoint by 1:35. A quick stop and I was back on the river by 1:56 to cover the last 27 miles to the finish line. Thankfully there was nothing exciting in those last miles. I finally saw the I-70 bridge and realized the finish line was just on the other side; that I’d have about 30 people waiting for me ready to scream and holler like crazy when I came in sight. Still I couldn’t help myself. I stopped paddling and just sat by myself, drifting in the Missouri River. For all the struggle I didn’t want it to end, so I took that time to savor the moment. As my friend Phil told me that moment was all mine and I wanted to think about it long enough to be sure I’d remember it. But all things end and I picked up the paddle for the last mile. What a great sight to see them standing there, and to hear them screaming my name. I hadn’t won anything. I hadn’t even come close to the middle of the pack. But it didn’t matter. The adventure had been great. When I pulled up to the bank something happened again that had been happening all during the race. It wasn’t my family that pulled me from the boat but other racers who came to me. Men and women who had already endured days of punishment on the river and who were also tired and sore. But they were ready to help me – again. And my ground crew was there to help. These guys were also tired from lack of sleep and driving the backroads of Missouri to get to where I would be. This is a race like no other. I saw people who were racing to win – and who stood a good chance of winning – turn their boats around and go back up river to help others in need. I saw people pulling supplies from their own boats to give food and warm clothing to other racers who’d flipped their boats and were paddling on through the cold of the night. There were winners on the podium on Friday night, those who had paddled straight through and arrived in 35 or 40 hours. But I think I’m also a winner, with my time of 82 hours 20 minutes, because I had the chance to meet some of these people. I’ve also been given the privilege of friends like you who believed in me way back last summer when I decided to do this. No job, no insurance, no boat, and you told me I could do this if I worked hard enough. Thanks to everyone who’s helped me and the people of Boileau, Haiti in so many ways. Back in port for a while and glad to be here. Well, I’m sitting at the breakfast table enjoying a coffee and counting the muscles that are NOT sore. I think there are only three or four. Seriously though, I’m moving around (slowly) and still alive. I finished near the back of the pack… but I finished. And it was one of the greatest experiences of my life. I don’t plan on doing it again though. One of the other racers, who had lived in Japan, told me there’s a saying over there. A wise man climbs Mount Fuji once. A fool does it twice. I think I’ll take that advice. Thanks to everyone who’s supported me in this thing, my ground crew, everyone who’s prayed for me, and all of you who left messages on the blog. I’ll post more later with some pictures I took from the river. My arms want to go to the position of holding a paddle and my hands look like claws from being wrapped around the paddle shaft for four days – swollen and blistered. So it’s another cup of java for me and then up to the health club and the hot tub for a while. Tomorrow we’ll drive back to Shreveport and Monday it’s back to work. Well, folks, he made it! At 6:20pm Captain Ned paddled right up to the shore and triumphantly raised his paddle in the air as friends and family cheered him on. It was a beautiful moment followed by lots of hugs, handshakes and high-fives. Afterward, we spend the evening enjoying bbq, cold beer and the company of some really wonderful people. I”ll upload photos to the Flickr site as soon as I can and I’m sure my dad will have a few things to say as soon as he has a chance to log on. Just wanted to let you all know he made it. 340 miles for Haiti! Good morning from St. Peters, Missouri! Captain Ned made it safely to Hermann last night at around 10:40pm. Before making it to the checkpoint a barge passed him. He was supposed to stay to the right but was blocked by a wing dam and so he had to paddle through the barge wake. He said the 5 ft. waves were “kinda fun”. This morning, after a somewhat restful night of sleeping 30 ft. from the train tracks (? ), Ned got up at 5 and left at 5:30am. About 30 minutes later he got fogged in. Apparently, he later came across a boat that had been traveling next to him and decided to paddle through the fog but ended up going the wrong way on the river! Even if it means his average speed is a little lower today, we’re glad he decided to play it safe and wait out the fog. For anyone who’s considering meeting him in St. Charles at the finish line, he should be arriving at around 6-7pm. For the rest of you, I’ll do my best to take lots of pictures and I’ll post them to the blog tonight. Captain Ned arrived in Jeff City to a crowd of family and many well wishers @ 1:05pm. After feasting and taking a quick 15 min. cat nap, he’s back out on the river and headed towards the Hermann checkpoint. He has 46 miles left for today and will paddle approximately 11 hours tomorrow. Navy crew member, Sharon, reports that he’s looking great and doesn’t seem to be in any great hurry! As for me, I’m headed to LAX and logging off for the moment but will continue to keep you abreast of any and all news. Hi, everyone! I wanted to let you know that I’m going to be printing out all of your comments so that I can give them to my dad when he finishes the race tomorrow morning. I’ve already copied all of the current comments to a document and I have to say, reading through them again almost made me cry. My dad is so fortunate to have you all supporting him and we are all incredibly thankful for every kind word, prayer and positive thought you’ve sent his way. I have a few more hours before I head to the airport and fly into St. Louis. I’ll print out the comments before I leave. LOVE from the White Rock Navy! Good Morning. This is an update from the White Rock Navy. It’s about 6 o’clock. I woke up at about 5:30 and the plan was to get up and get on the river but the river is totally foggy and you can’t see anything so We all stayed in our sleeping bags. That was I guess about half hour ago and I can’t get back to sleep because I’m too stiff and sore. So, I’m up walking around and stretching. Anyway, we’re at Katfish Katie’s and getting ready for the last full day and then hopefully a short day tomorrow. I’m not sure what time we’ll get out of here since, like I say, it’s pretty “pea soup foggy” every where you can’t see anything. But we’re all doing okay under the circumstances and stand by for updates as things progress I guess. Some news from race central, a little tidbit, I found out on the first day one of the leaders pulled out of the race because he got hit in the head with a 40 pound flying carp. It jumped out of the river and hit him and he was okay but he decided that since he was kind of dizzy and wasn’t going to push through. Also, as I understand it the leaders of the race finished last night sometime. What else?… Ohh going to Lisbon, yesterday couple of women in front of us in a two person canoe went too close to the Lisbon bottom shoot and got sucked in, and tangled up in a big log jam. They were hanging on to the logs and one of the rescue boats managed to pull the out. The boat couldn’t be retrieved and is still jammed in there in the rushing waters. So, it’s probably lost but at least they’re okay and that’s good. So, that’s about it this morning and I guess the team will be giving you updates as the day goes along. One more full day and I’ll be done with this. Thanks, everybody and I guess the next time you’ll hear from me is when I’ve finished the race! Thanks, again. Bye.